Imagine a legally-binding multilateral treaty that would regulate the global trade in all conventional arms. Under such a treaty, States would be obliged to take into account certain criteria before authorising arms exports. These criteria could include the importing State's respect for international humanitarian and human rights law, the overall security situation in the recipient State's region, and the risk of the exported arms being diverted or misused, for example. Believe it or not, such a treaty does not yet exist. States do have a range of obligations under existing international law when it comes to the arms trade. These are contained, however, in a patchwork of disparate regulations at the global, regional and national levels, some of which are legally-binding, some not. This would not be so much of a problem if States consistently complied with the obligations they already have. The fact is, not all do, and so the irresponsible trade in conventional arms continues. But an 'Arms Trade Treaty' (ATT) is in the works. The purpose of such a treaty would be to identify and clarify States' existing obligations under international law when it comes to the arms trade and to compile these into a single, legally-binding treaty text that would provide clear criteria for States to use when deciding whether or not to authorise an arms export. The UN General Assembly identiﬁed the need for an ATT in 2006 with resolution 61/89. This resolution, supported by 153 States, put in motion a process for elaborating such a treaty. It solicited the views of all UN Member States on the feasibility, scope and parameters of an ATT. An unprecedented 98 States made their views known. The vast majority of these believe that an ATT is both needed and feasible (see the 2007 and 2008 UNIDIR reports analysing the views of States). The resolution also established a Group of Governmental Experts (GGE) to continue examining the feasibility, scope and parameters of an ATT, informed by the views expressed by UN Member States. The GGE, comprising experts from 28 States from all regions of the world, met for two weeks during the ﬁrst half of 2007. On July 28, the GGE began its final, two-week meeting, during which it should draft a report to this autumn's session of the UN General Assembly. It will then be up to the General Assembly to decide how best to proceed towards an ATT. 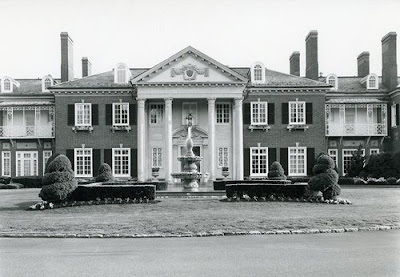 On 25-27 July - over the weekend before the GGE began its final session - the Geneva Forum convened an informal meeting at Glen Cove Mansion on Long Island, New York, (pictured above) to discuss the modalities of moving towards an effective Arms Trade Treaty. Twenty-one of the 28 States represented on the GGE participated, together with 13 other interested States and a number of experts from NGOs, international organisations and the arms industry. The purpose of the meeting was to facilitate interaction between GGE members and a wider group of States, along with civil society and industry experts, and also to provide constructive input to the work of the third and ﬁnal meeting of the GGE by providing an opportunity for wider stakeholders to air their views on areas of substance. The discussion that took place was both interesting and illuminating and provided a rare insight into the ambitions and concerns held by certain key States. I do not have space here to summarise the weekend's discussion but a brief (4 pages) report of the meeting is available online. The meeting demonstrated two things very clearly. First, there is a very high level of support for an effective Arms Trade Treaty among States, civil society, international organisations and the arms industry. Second, there are currently some differences of opinion, particularly among States, on the scope of an ATT and on the parameters that should be used in its application if it is to be effective. The outcome of the meeting also suggests two things; ﬁrst, that the differences of opinion that do still exist are not insurmountable and, second, that there would seem to be a strong preference for an ATT with a broad scope and relevant, clear parameters that include, at a minimum, considerations related to the respect of UN Security Council arms embargoes, international human rights law and international humanitarian law. As the recent 3rd Biennial Meeting of States to consider implementation of the UN Programme of Action on small arms and light weapons demonstrated, many States are losing patience with the low level of results being posted by multilateral disarmament and arms control processes (see our post "UN small arms process 'back on track'." A lot of time and resources have already been invested in moving the ATT process to the stage it is at today. Much more work remains to be done if negotiations are to be successfully initiated and concluded and if an ATT is to be put into practice in a timely and effective manner. The eyes of the international community are on the GGE as it commences its ﬁnal meeting. The international community expects from the GGE a full examination of the issues before it so that progress towards an effective ATT can be continued. You say: "As the recent 3rd Biennial Meeting of States to consider implementation of the UN Programme of Action on small arms and light weapons demonstrated, many States are losing patience with the low level of results being posted by multilateral disarmament and arms control processes". Seems to me this began not with the BMS, but the more significant agreement of the Oslo Treaty.... surely, it must have shown some of the diplomats that progress is possible, despite the 'business as usual' you've indicated over the course of your blog just isn't cutting it? Good point. However, I would also say that the Oslo Process experience has made many States more committed to finding solutions within UN frameworks. There would seem to be less patience now for allowing one (or a small number) of States to hold up progress in UN disarmament and arms control processes. The vote at the 3rd BMS is one illustration of this. Basically, what seems to be happening is that States are finally beginning to de-couple the concept of consensus from the concept of unanimity (and about time too!). Consensus does not mean that everyone is in agreement; the word for that is unanimity. Consensus means that almost everyone is in agreement. Before Oslo, States were more likely to allow UN disarmament and arms control processes to be blocked by lack of unanimity, even if only one or two voices were dissenting. Nowadays, at least judging from the 3rd BMS, it would seem States are willing to do what is necessary to move forward on the basis of consensus. This, in my view, is a big step forward.